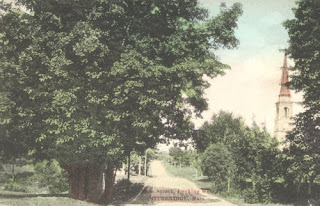 Thinking Out Loud In Sturbridge: Could This Be The Hidden Church In The Old Postcard Above? Could This Be The Hidden Church In The Old Postcard Above? 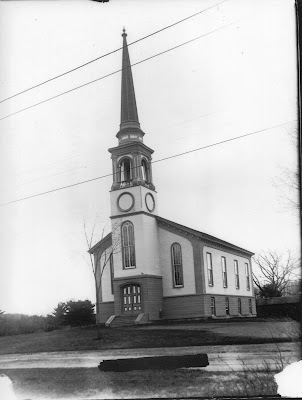 "HOWEVER--- It appears to be the Unitarian Church location would be the area betwwen the Sturbridge Post Office and Sadie Greens. Style is exactly the same, but the uphill in the background would have to be where the current Police/Fire complex is. There does not look like Route 15 is there, so it could be an older photo than that road. It also looks to set back further than the church was in my younger days. But, the steeple is the same except the photo OSV has shows a color difference which is also what I remember. Could have been painted before what i have. And thast is the white area around the oval topped bell openings. Tell you what-- I will copy the photo I have and send it as soon as I get it done as an attachment in another e-mail.